A sheriff's deputy opened fire at a suspect who rammed into him and his motorcycle with a stolen vehicle during a traffic stop in Hayward Thursday morning, according to the Alameda County Sheriff's Office. The suspect, who was described as a male in his early 20s, fled the scene and remains at large, sheriff's Sgt. Ray Kelly said. The officer suffered "relatively minor injuries" despite being struck and dragged by the suspect's SUV. "It's pretty actually incredible that this officer wasn't killed," Kelly said. The violent scene started at 9:41 a.m. in the area of W. A Street and Arbor Avenue when the deputy conducted a traffic stop on an allegedly speeding 2003 GMC Yukon, Kelly said. 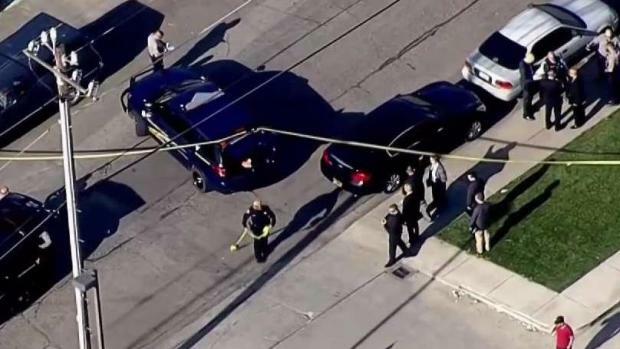 Officers are searching for a suspect following an officer-involved shooting in Hayward Thursday morning, according to the Alameda County Sheriff's Office. Bob Redell reports. After failing to immediately pull over, the driver eventually came to a stop along Arbor Avenue, Kelly said. 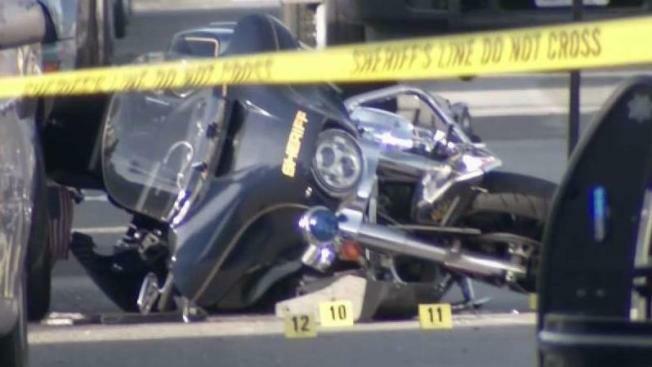 As the deputy issued commands over a loudspeaker, the driver put the vehicle in reverse, slammed into the deputy and his motorcycle, and continued driving in reverse with the officer trapped under the SUV. "Somehow the officer was able to get off the bike as he was being pushed and almost crushed behind the car," Kelly said. The driver maneuvered again and allegedly attempted to run the deputy over once again, Kelly said. The deputy proceeded to fire multiple rounds into the SUV's windshield. "We’ve done a quick review of the body camera footage and it shows that as the officer is firing into the windshield of that car, the suspect ducked down underneath the dashboard," said police Sgt. Ray Kelly. The driver of the SUV took off from the scene and drove a few blocks to the area of W. A Street and Royal Avenue before hopping out of the car and fleeing on foot, Kelly said. It is not clear if the driver was injured, Kelly said. A shelter-in-place was ordered for residents in the area of W. A Street and Royal Avenue while officers combed the area in hopes of locating the suspect. The sheriff's office later lifted the lockdown orders, but the search for the suspect continues. The officer is okay and was released from the hospital with some injuries to his arm and hand.